I don't remember what the circumstances were why I missed Icelanders Skalmold seminal album. I had the promo delivered to me and everything, but I confess the music just went by me. (That is one of the main issues I have with reviewing duties altogether, as you sometimes funnel way too much music through your brain in a given time span.) I normally don't reference other reviews in my own, but here I would make an exception since many people out there loved Baldur. Maybe you should check it out, and given my attitude towards Born Loka maybe I should too. Before Napalm took over distribution for Skalmold, they were on Faroese label Tutl, and those guys know when it gets to Nordic metal. Just see how the signing of Tyr turned out 10 or so years ago. Skalmold though is no Tyr, although deep inside I was longing for similarities. The Icelanders have those distinct stretchy Nordic melodies in some of Born Loka compositions (Miðgarðsormur) and small periodic hints of cleanliness in Björgvin Sigurðsson vocals remind of early Tyr, but then the same Miðgarðsormur becomes a pretty hefty thrash rather unexpectedly. Just like another obvious Nordic folk melody runs into more standard riffs in Gleipnir, with those riffs getting pretty interesting when they become "deconstructed" towards the end. Somewhere at that point, or elsewhere, doesn’t matter, the feeling emerges that one of many standard pagan folk bands Skalmold is definitely not. Icelandic lyrics and mythological story telling they do (although I do not have the booklet), but the focus of Born Loka is both on harshness and variety, both within the songs and between the songs. Sleipnir has lunging rough riffs, Fenrisúlfur breaks out with a stomp, and throughout the album Skalmold makes sure their guitar sound is distorted, vicious and threnodious. This is the music not to wistfully dream to, Skalmold wants to maul you instead. This is true for catchy choruses or extended instrumental sections where the band showcases themselves to be quality musicians. 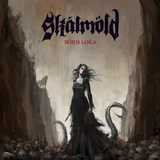 The transitions between parts within a song sometimes baffled me (Fenrisúlfur), but it is very unexpected and rather rewarding to have Skalmold cover a wide ground between steady death metal riff American Vore style in Vali, blackened folk with a blastbeat melody in the extreme ode Hel, the power metal catchy gallop in the ultimate closer Loki, or a clean singalong Narfi (the song to which Korpiklaani would really break out the accordion to). Can you imagine all of those things to coexist on the album? Skalmold manages to have it all combined, don’t lose focus and even add symphonics and oboe in the bookends Óðinn and Loki, plus the female background vocals in the chorus. The combination of the oboe and guitars in the instrumental section of Loki sounds incredibly melodic and heroic. It takes a little bit of patience with Skalmold to get to the crux of their sound, and maybe that is something that failed me on Baldur. In Born Loki, however, I did enjoy the story Skalmold had in store, especially on the second half of the album, beginning after the short interlude Himinhrjóður, when chasm was opened and the beast emerged.